Counting is one of the most common tasks people do in Excel. It’s one of the metric that is often used to summarize the data. For example, count sales done by Bob, or sales more than 500K or quantity of Product X sold. COUNT – To count the number of cells that have numbers in it. COUNTA – To count the number of cells that are not empty. COUNTBLANK – To count blank cell. COUNTIF/COUNTIFS – To count cells when the specified criteria are met. There may sometimes be situations where you need to create a combination of functions to get the counting done in Excel. One such case is to count cells that contain text strings. Text Strings or Alphanumeric characters. 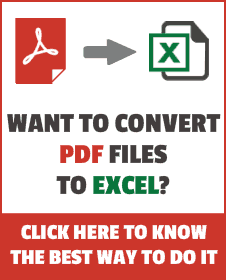 Example – Trump Excel or Trump Excel 123. A cell that looks blank but contains =”” or ‘ (if you just type an apostrophe in a cell, it looks blank). Example – TRUE and FALSE. Example – @, !, $ %. It has all the combination of text, numbers, blank, special characters, and logical values. Asterisk (*): An asterisk represents any number of characters in excel. For example, ex* could mean excel, excels, example, expert, etc. Question Mark (? ): A question mark represents one single character. For example, Tr?mp could mean Trump or Tramp. Tilde (~): To identify wildcard characters in a string. See Also: Examples of using Wildcard Characters in Excel. Now let’s create formulas to count different combinations. This formula uses COUNTIF function with a wildcard character in the criteria. Since asterisk (*) represents any number of characters, it counts all the cells that have text characters in it. It even counts cells that have an empty string in it (an empty string can be a result of formula returning =”” or a cell that contains an apostrophe). 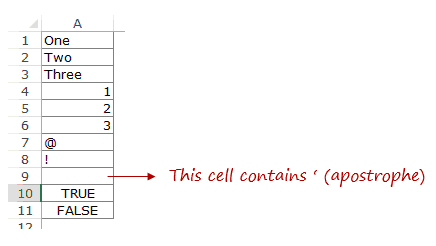 While a cell with empty string looks blank, it is counted by this formula. Logical Values are not counted. In this formula, the criteria argument is made up of a combination of two wildcard characters (question mark and asterisk). This means that there should, at least, be one character in the cell. This formula does not count cells that contain an empty string (an apostrophe or =””). Since an empty string has no character in it, it fails the criteria and is not counted. Logical Values are also not counted. The first part of the formula uses a combination of wildcard characters (* and ?). This returns the number of cells that have at least one text character in it (counts text and special characters, but does not count cells with empty strings). The second part of the formula checks for logical values. Excel ISLOGICAL function returns TRUE if there is a logical value and FALSE if there isn’t. A double negative sign ensures that TRUEs are converted into 1 and FALSEs into 0. Excel SUMPRODUCT function then simply returns the number of cells that have a logical value in it. These above examples demonstrate how to use a combination of formulas and wildcard characters to count cells. In the similar fashion, you can also construct formulas to find the SUM or AVERAGE of a range of cells based on the data type in it. Count the Number of Words in a Text String.